one sentence that breaks your heart. One of the main forms of communication between the army and families at home was through telegram. Every family received a telegram giving them news of a soldier’s death. They were often delivered by a young boy. Seeing the telegram runner on your street filled many with dread. For those whose house he approached the feeling must have been devastating. For William Friar’s mother, Eleanor, the news of her son’s death would have come as a complete shock. On October 15th 1917 she received a telegram with the simple sentence ‘doing splendidly’. The next telegram she got was not such good news. It wrote that her son was 'seriously ill with gunshot wounds'. The next telegram was worse still; he was 'dangerously ill'. The fourth telegram was the most heartbreaking news of all. A mother’s nightmare was crammed into one sentence, ‘Regret Friar Died Fifth November’. Communication at the time was difficult. The emphasis was on simply informing the family as quickly as possible as to his fate. There was little room for sentiment. From the Friar family records, WIliam Robert Friar (aged 15) on the Runic with his uncle. You have been given the telegrams received by Mrs Friar informing her of her son's injuries. You are now tasked with discovering more of the story behind William Robert Friar. How much of his story can you piece together? The suggestions below will help you on your research journey. The How We Find It Fact Sheet will also be a helpful tool in helping you discover the pieces of William's puzzle..
You're in luck. 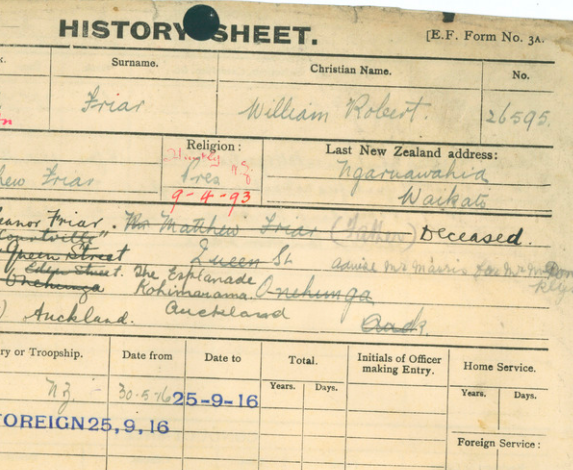 William served in the New Zealand Army so his records can be found online at the Auckland War Memorial Museum Cenotaph. This is your most important search. Collect as much information as you can. Once you've found William's Serial Number move to Archway and search for his service documents there. HOW DID YOU FIND OUT THINGS WITHOUT A PHONE? William's mother must have been terrified each time someone delivered a telegram to her home. News of injury – or worse – was broken to loved ones by telegrams delivered by bicycle. Telegrams were short messages delivered via morse code and then translated by Post & Telegraph staff. They were despatched from impressive new post office buildings around the country. Use Digital NZ to find images of these buildings. William Friar was a champion shooter at schoolboy level. He was judged the best school boy shot in New Zealand and this won him a most unusual prize. Use Papers Past to find out about his prize and the journey it took him on. What was the remarkable gift that William was given and where is that gift held today? who received the william friar Cadet memorial prize? The William Friar NZ Cadet Memorial Prize was established in memory of William. It is still awarded today. Use Google to find instances of it being awarded since its establishment. William is remembered on other Rolls of Honour as well - both the Onehunga Presbyterian Church and the Huntly Public School (RoH now missing) have Rolls of Honour carrying his name. what happened to the William friar memorial drinking fountain? Many parents donated prizes, established cups, scolarships and bursaries and erected memorials to sons that had been killed in the First World War. Often these memorials were connected with schools as students symbolised the potential and youth that had died with their sons. In 1919 William Friar's Mother unveiled a Memorial Drinking Fountain with students from the Onehunga Public School present. Use Google Maps to pinpoint the original location of the drinking fountain. Where is the base now? who holds the W R Friar collection? Many of the important items from William's life were donated to the Waikato Musuem and form part of the For Us They Fell Exhibition. You can see William's Dead Man's Penny and other important documents from William's life in this exhibition. What other items can you find that have been part of the Willliam Friar collection - use Google to understand the Waikato Musuem part of this story. Uncover more pieces of William's story. Check Births, Deaths and Marriages to see if their were any Friar babies born between 1914 and 1920. It transpires that William left a young woman behind when he left for the Front and that she was indeed pregnant. William Robert (James) Friar had a relationship with Kirikowhai TeTauwhara-Weti of Tangirau Pa a small settlement on the outskirts of Ngaruawahia in the Waikato, in 1914 on October 9 a girl was born and named Evelyn Rose Kirikowhai (also known as Ivy) William was not aware of the child before he left to go to war. Later on his family were told of her existence. Evelyn Rose was raised from the age of 13-14 by Princess Te Puea Herangi at Tuurangawaewae Pa, in Ngaruawahia. She went on to meet and marry Inia Te Wiata who in 1939 came to Tuurangawaewae to be tutored by Master Carver Piri Poutapu. Inia was from Mokau and Otaki, he had the distinction of being a Master Carver also in his latter years. He became NZ’s first Maaori opera bass singer of International fame. Evelyn Rose (died in 1976) & Inia (died in England in 1972) had six children, three are still living in the Waikato. William Friar is survived by 33 Grand children & 15 Great grandchildren. Urgent cables to Mrs Friar are connected with the story of William Robert (Bill) Friar who attended Huntly Primary School, Onehunga Public School and Three Kings College. The original telegrams are held by Collection of Waikato Museum Te Whare Taonga o Waikato 1984/2/91.1-5. This story is told with the permission of Murray Friar, Bill Te Wiata and Gloria Tukere on behalf of the Friar Family. “Erected/ in memory of / William Robert / Friar / 3rd Battalion / N.Z. Rifle Brigade / who died on 5th November / 1917 at Boulogne France / of wounds received / at Passchendaele / on [? ]th October 1917 / aged 24 years. / Pro Patria”. The base of the fountain can now be found at the Waikaraka Services Cemetery. Research starting points for William's Story. the telegraph mrs friar received reporting william's death.